Halloween just passed us by, and if you have children, you likely still have piles of candy in your house: Jolly Ranchers, Payday bars, Kit Kats, Hershey's bars, or my personal favorite Reese's peanut butter cups. These are just some of the great brands that are all made by The Hershey Company (NYSE:HSY). It's these great brands that have given the company a dominant 45% share of the domestic confectionery market and allows it pricing power. I don't know about you, but I've had the non-name brand versions of some of these and they are a far cry from being the same. Due to its dominant position, brand power, and pricing power, the shares of The Hershey Company typically trade for a premium which is well deserved. The company has grown revenue every single year since 2002 with solid total returns. Over the last decade, total returns have amounted to 7.2% annually. The annual returns jump to 11.7% for the last 20 years and 13.2% over the last 30 years. Put another way, every dollar invested 30 years ago is worth $41.54 now. 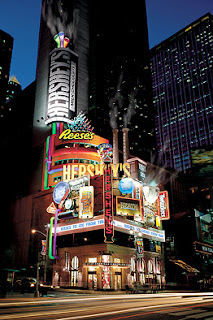 I think The Hershey Company gets overlooked by dividend growth investors due to its shorter dividend growth streak. The company kept the dividend the same for 10 straight quarters while the financial crisis was playing out, which was a prudent move at the time. However, in its history, it hasn't decreased the dividend once. The Hershey Company has delivered excellent returns for shareholders over the years but what could they potentially look like going forward? Continue reading The Hershey Company quick analysis on Seeking Alpha. Also, in case you missed it this morning make sure you check out the PepsiCo quick analysis as well. Check out my Stock Analysis page to find other stock analyses.